Rubber Room Ramblings: ANY SIZE FRAME WITH YOUR FRAMED TULIPS EMBOSSING FOLDER! ANY SIZE FRAME WITH YOUR FRAMED TULIPS EMBOSSING FOLDER! Welcome back to Watch It Wednesday in the Rubber Room. In today's video I will share with you a great little "tricky technique" on how to make the Framed Tulips Embossing Folder frame any size you want! 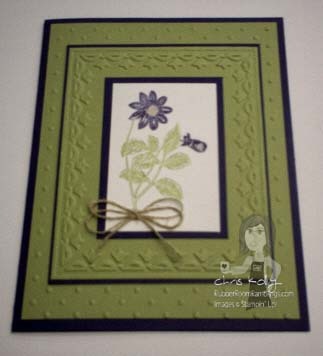 I got this idea from Sharon Fields, another Stampin' Up! Demonstrator who shared it in a written tutorial, that I found fascinating and inspiring! I hope you enjoyed the video and the "tricky technique"! Be sure to stop by tomorrow, and I will share with you all the details on how I made this card, along with the Product Parade containing a list of all the great Stampin' Up! products I used to make it! BIG SHOT LETTERPRESS PLATES INSTRUCTIONS! SIMPLY SENT MEDALLION MEDLEY ALL DRESSED UP! TIME IS RUNNING OUT FOR FREE BITTY BUTTONS! RECIPE LUNBOX TIN PRODUCT PARADE! MY "DOVE" CANDY SOURCE REVEALED! WATCH IT WEDNESDAY DOVE CANDY TREAT VIDEO! GLIMMER PAPER AND EAT CHOCOLATE! NEW ADDITION TO MY LEFT SIDE BAR! NATURE WALK and THANKS FOR CARING! WATCH IT WEDNESDAY IS BOW BEAUTIFUL! BUILD A CUPCAKE PUNCH WITH POMPOM TRIM! BRING ON THE CAKE AND SALE-A-BRATION SNEAK PEEK! OCCASIONS MINI IS HERE AT LAST! DISTRESSED BOTANICAL GAZETTE AND NATURE WALK! BABY BLOSSOMS AND MORE OCCASIONS MINI PRODUCTS! SNEAK PEEK AT NATURE WALK!